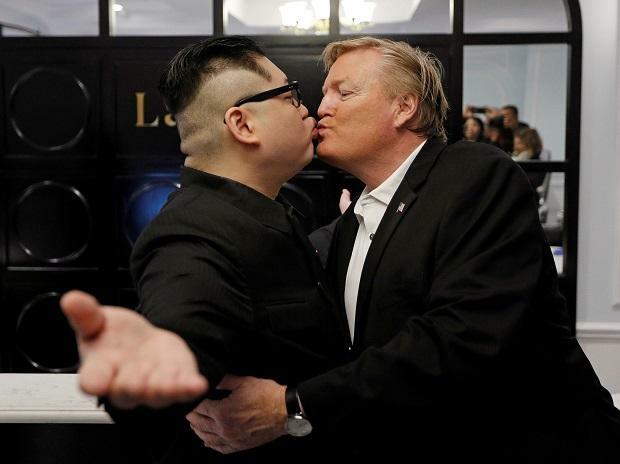 A Kim Jong Un impersonator was hauled from his hotel Monday ahead of his planned deportation from Vietnam before the real North Korean leader meets US President Donald Trump in Hanoi later this week. Howard X arrived in town with Trump impersonator Russell White last week, staging a fake summit on the steps of Hanoi's Opera House amid a swarm of press and hired security guards. The real Trump and Kim will meet for a summit in Hanoi on February 27-28 to build on their first meeting in June in Singapore which failed to produce any concrete moves to dismantle Pyongyang's nuclear arsenal. The Kim lookalike was questioned by Hanoi police on Friday and informed he would be put on a plane back to Hong Kong where he lives. The impersonator was told by Vietnamese immigration officials his visa was "invalid", but said he received no further explanation. "The real reason is I was born with a face looking like Kim Jong Un, that's the real crime," he told reporters Monday, getting into a van headed for the airport with three Vietnamese men, not in uniform and who did not identify themselves. White will be permitted to stay in the city but has been asked to stop appearing in costume in public. The Trump doppelganger has been stopped on his Hanoi walkabouts by locals and tourists eager to snap a selfie with "The Donald". Howard X said he thought he was being deported because the real Kim "has no sense of humour". His plane ticket back to Hong Kong would also be cheaper for Vietnamese authorities than a flight for White back to his native Canada, he added. "Satire is a powerful weapon against any dictatorship. They are scared of a couple of guys that look like the real thing," said Howard X, wearing a signature Mao-style black suit and thick black glasses. Vietnam is hastily preparing for this week's Kim-Trump summit, deploying security personnel across the city, where hotels and government buildings are getting last-minute facelifts ahead of the meeting. The communist capital has billed itself the "City of Peace" ahead of the talks and is carefully corralling press events to avoid any embarrassing PR moments with the world watching the one-party state.